The Congress party on 1 September slammed the government over demonetisation and asked Prime Minister Narendra Modi to stop spreading false propaganda, after the GDP of the country plunged to a three-year low. 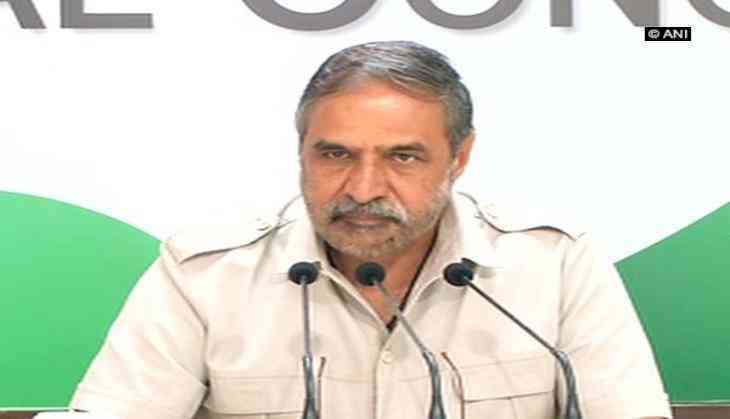 Speaking in a press conference, Congress leader Anand Sharma said that the Bharatiya Janata Party (BJP) did not pay heed to the forewarnings given by the Congress before demonetisation. "We told you about the bad affects of demonetisation. GDP's first quarter reports came out yesterday. India's GDP is continuously falling for the last 6 quarters. He is responsible for the economic condition of the country," he said. Sharma asked the government to come up with the GDP numbers for the past ten years, which will help the people to know about the direction they are heading in. He said, "If the government comes out with the numbers for the past ten years, it'll be proven that ever since this government has taken shape, India's economy has continuously declined." He blamed the Prime Minister and Finance Minister Arun Jaitley for a number of anomalies in the economy and accused them of not coming up with solutions. "There has been a sharp decline in public and private sector industries. There has been 7 per cent drop in investments. One-third of existing industrial capacity is not utilised. The Prime Minister and the Finance Minister have no roadmap to restore the economy," he said. He added that the Prime Minister must stop making false claims about India being the fastest growing economy. "If this is the condition of the fastest growing economy, we'd like to know what low growth is," he said, taking a jibe at the Prime Minister. He also said that the manufacturing industry is continuously contracting and that 'Make in India' continues to remain a slogan. "The BJP continues to be delusional. It has achieved a new benchmark of false propaganda, incompetence and betrayal of people," Sharma said.